Unemployment could double to four million unless the Government takes drastic action to boost public spending and create new jobs, a Bank of England official has warned. In a dire outlook, Monetary Policy Committee member David Blanchflower also said the recession could be deeper and longer than the Bank previously predicted. He added that the Government needed to tackle the soaring numbers of young people out of work by raising the school leaving age sooner and pushing more people into higher education. 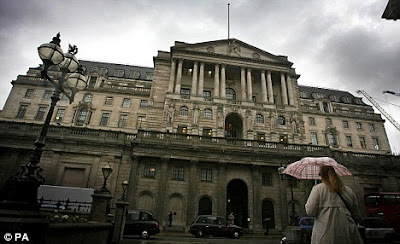 Doom and gloom: The Bank of England's predictions that UK output would tumble 3.5 per cent could prove 'too optimistic'. Speaking at a Westminster conference, Mr Blanchflower called for the Treasury to launch a near-£90billion fiscal stimulus, including tax cuts and investment in new schools and hospitals. This would help create 750,000 new jobs, he said. David Blanchflower says the recession could be deeper and longer than initially expected..
Mr Blanchflower has proved one of the most prescient members of the MPC, calling for interest rate cuts a year before the rest of the committee. Last summer he forecast unemployment would hit two million by Christmas - a prediction that was fulfilled in January. Last month the Bank of England predicted UK output would tumble 3.5 per cent this year, before recovering 1.2 per cent in 2010. But this is likely to prove too optimistic, Mr Blanchflower said yesterday. As a result, predictions that jobless ranks will peak at three million are also likely to be too rosy. 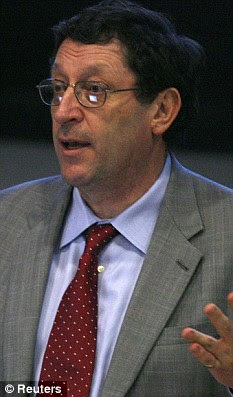 '(With) any forecast of unemployment and output, the likelihood in a recession is we have undercooked it,' he told MPs. A surge in unemployment to four million would mean the total surpassing the heights reached in the deep recession of the 1980s, when joblessness peaked at nearly 3.3million. Mr Blanchflower's fiscal stimulus plan includes 'large cuts' in income taxes and national insurance contributions for the lowpaid and young people. In a paper co-written with David Bell of the University of Stirling, he said the Treasury should plough billions into construction projects by health authorities, universities and housing associations. The raising of the education leaving age to 18 should be brought forward to this year to prevent legions of school leavers seeking jobs when there are few available. This summer more than 600,000 people will leave schools and universities and embark on a desperate search for work. Already 40 per cent of the unemployed are under 25. Mr Blanchflower said young people's entire lives would be affected if they were unable to find work now. Carmaker Honda is asking its workers to accept a pay cut for at least a year to ensure the survival of its UK factories. The Japanese firm is sending letters to 3,600 workers at its Swindon plant stressing the dire state of car manufacturing. The letters do not state the size of the cut, but a similar arrangement at Toyota has seen both working hours and pay cut by 10 per cent at its two UK plants. The average wage for lineworkers is around £22,000. The Unite union said negotiations were yet to be held on the issue.